I am in ecstasy, O my mother, for I have found my True Guru. I have found the True Guru, with intuitive ease, and my mind vibrates with the music of bliss. The jeweled melodies and their related celestial harmonies have come to sing the Word of the Shabad. The Lord dwells within the minds of those who sing the Shabad. Says Nanak, I am in ecstasy, for I have found my True Guru. This entry was posted in Shabad Kirtan and tagged 31 Raags of Sri Guru Granth Sahib Ji, Gurmat Gian Group, Gurpreet Kaur, Guru Granth Sahib, Keerat Kaur, Raag Ratan, SGGS, Sikh Music. Bookmark the permalink. Gur Fateh. 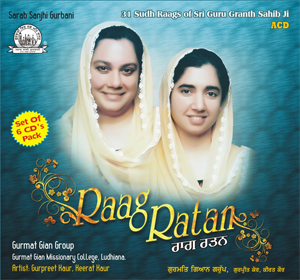 Please accept my thanks for letting me know about the new album ‘Raag Rattan’ all day I listen to kirtan by Gurpreet ji and her co singers. They are amazing. Thanks Rajinder Ji. It gives us immense satisfaction when our Sangat likes our Gurbani Singing. Do keep visiting our Blog. 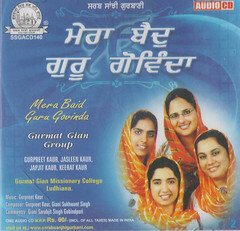 for giving us the Opportunity to enjoy the Melodies of Gurbani Kirtan thru ‘Gurmat Gain Group’ (3Gs) , Aap ji ne ‘Raag Ratan’ naam di Album bibi Gurpreet Kaur ji ate Keerat Kaur ji di Surili Awaz which Release kar ke Sri Guru Granth Sahib Ji de 31 Sudh Raag Sikh Sanagtan nu nihal kar rahe ho, Satguru ji aap ute Meher Banay rakhan , atte aap ji nu sada chardikala wich Rakhan ji….. Gurfateh…. Thanks for your message. 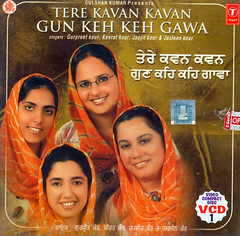 With Waheguru’s mehar we are trying to compose and record Raag based Gurbani Kirtan. With the completion of 31 Raags Project Gurpreet Kaur plans to take up Mishrit Raags of Sri Guru Granth Sahib Ji. There are so many Mishrit Raags in Sri Guru Granth Sahib Ji which the world of Music is unaware of. 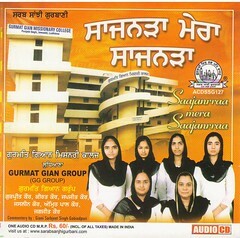 With Sangat’s Good Wishes and Waheguru ji’s Kirpa we would try to complete this new project in the next year. Waheguru ji ki Fateh, thank u so much for giving us the opportunity to listen the kirtan cds , we enjoy the kirtan in a sweet voice so much can’t express in words Waheguru ji hameshan aap sabh nu chardikala bakhshan ji . GurubFateh parwan karni ji . Gur Fateh Balwant Singh ji. This WP audio player is a new addition to our blog and have plans to make use of this in different ways. Our whole family enjoy s the kirtan in her sweet voice……. I am wife of Avtar Singh Missionary, gori katavachak and kirtani. I can play any raag with my guitar. The bibian have beautiful voices. Bahot sona. it is another wonder that an English lady after Amritpaan became Bibi Harsimrat Kaur Khalsa and learnt Gurbani gayan in Nirdharit raagas and that too with guitar. This is the true order ,”Ghar ghar andr dharmsaal hove keertan sadaa vasoaa”. May WaheguruG bestow all power and concentration for such great Jathas including Gurmat Gyan Group for spreading the true Words of Baba Nanak. Our Guru’s Bani is ‘Great Wonder’. A Wonderful gift to humanity. There is nothing like Gurbani on this planet. Any musical instrument can accompany Gurbani singing and guitar is a beautiful musical instrument. 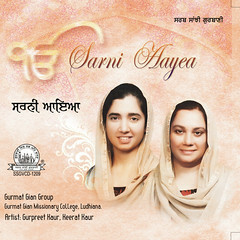 I would love to hear Harsimrat Kaur Khalsa’s recordings of Gurbani Keertan. Thanks for appreciating the work of Gurmat Gian Group. Do keep visiting as we keep posting new shabads frequently. The compilation of serial wise all the Shabad Bani of Sri Guru Granth Sahib Ji in Raagas as prescribed. Is there any such project at present or for future or have already been completed. If available kindly forward the details thereof. Plus many CD containing Shabads in the various Raags. One on going project of Asa Di War has be recorded very recently and would be released after sometime. 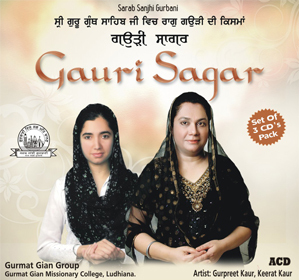 God willing, After this: Gurpreet Kaur plans to bring about separate Albums for each 31 Raags of SGGS ji. Yes, there are 60 Raags mentioned in Sri Guru Granth Sahib. If Raag Mala too is taken into consideration the numerical number of Raags mentioned goes up further. But, conventionally, the Gurbani mentioned in Sri Guru Granth Sahib ji is divided into Basic or Shudh Raags and Mishrit Raags. All the learned Kirtanias find 31 Shudh or Basic Raags and the remaining as in Mishrit Raags. Ultimately, these numbers do not matter or count in any ways. The purpose of singing Gurbani in Raags is to Beautifully convey the Message enshrined in Guru Granth Sahib ji. It would be pertinent to say that lets not miss the Flowers & Fruits while being busy counting the trees. Yes you are right. But why some learned people give wrong information. It will be much better that they should avoid talking on this subject, i.e. on the number of raags. There is nothing like a ‘Wrong Information’ when Sikh Musicians divide the Raags mentioned in SGGS into Shudh & Mishrit Raags.